At Gibsons Farm Shop you will find kitchen cupboard essentials, but more interestingly you will discover a large range of ambient delights. Peruse our locally supplied teas and coffees, our own label chutneys and preserves or how about handmade soups full of goodness. The Kent & Sussex Tea and Coffee Company is an independent Loose Tea and Coffee business run by the Smith Family. Today the Company is involved with the importing, packing, wholesaling and retailing of Leaf Tea and the importing and roasting of an extensive range of Coffees for commercial and private customers. The factory and warehouse are situated near the village of Pluckley, in the heart of the English County of Kent. The Kent and Sussex Tea and Coffee Company was established in 1982 by Mr Malcolm Smith and his son Richard Smith on their return from India. The Smith families involvement in tea in India in the 1920's when Mr Robert Stammers travelled to India to work in the tea trade on the plantations of Assam in North East India. Ultimately He was the Manager of the famous Behora Tea Estate. Daughter Janet married an ex Gurkha Mr Malcolm Smith who had also joined the tea trade. Based in Calcutta Malcolm Smith worked for the McLeod Russell Tea Plantation Company. On retirement from India, the family settled in the village of Pluckley which is the most haunted village in England. On request from the local grocer, some tea was sourced and we named this Pluckley Tea. To this day it is still one of our most popular black tea and a main day to day brand for the Company. This family business now operating for over 40 years, operates from a converted Kentish Oast House on the edge of the picturesque village of Wye. Our premises include a factory with a small factory shop that has a viewing gallery overlooking the production area. The artisan production is supported by modern filling and capping equipment which enables us to optimise efficiency without impacting on quality. It goes without saying that we source as much UK fruit as we can for our products: apples, plums, damsons, strawberries, tayberries, loganberries, blackcurrants, blackberries for example, though there are some fruits which are difficult to obtain such as cherries due to the short season and high fresh demand from retailers. 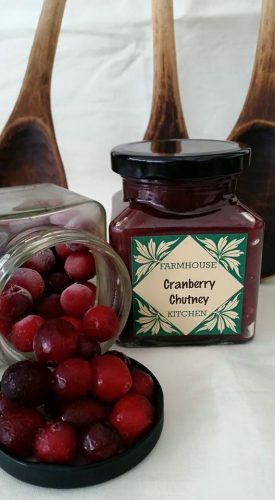 Starting back in 2001 from the family kitchen experimenting with recipes and exploring new ideas Farmhouse Kitchen was born, A artisan producer of jams, chutney, marmalades, sauces, mustards and supplier of local Kent honey. We prepare by hand most fruit & veg we use in our recipes ( we cheat sometimes ) supporting local growers where possible and make our products in small batches to retain flavour and colour without using any artificial ingredients. Over the years we've worked hard to build an enviable reputation for quality, excellence and variety of choice. We offer a bespoke labelling service so you can have your own logo on the products if you wish. We firmly believe that good food comes from good ingredients, simply prepared, without any unnecessary additives. 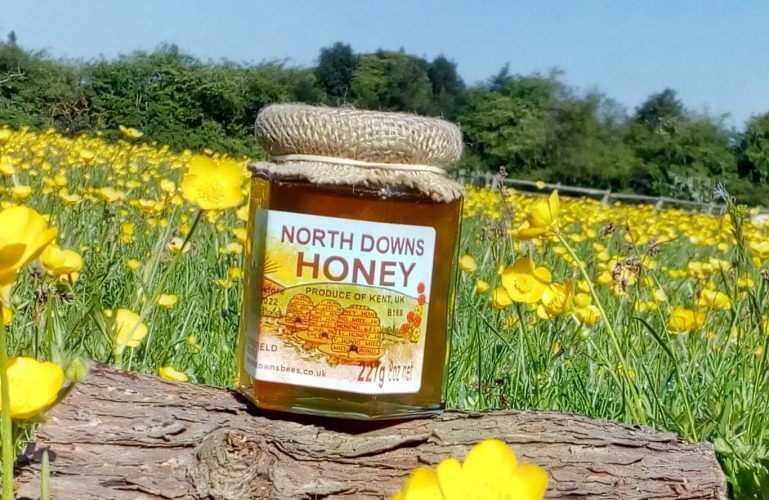 North Downs Bees are a small family business producing honey and honeybees for sale. We have at present around one hundred hives kept at selected sites within ten miles of Canterbury in Kent. Our bees gather nectar and pollen from the crops and wildflowers of the chalk downlands. Beginning with the early fruit trees, the main sources thereafter include sycamore, lime, sweet chestnut, clover, blackberry, and rosebay willowherb. Smaller contributions come from hedgerows, roughs and scrub. Grassland wildflowers such as dandelions, knapweeds, chicory, and the climber ivy are among the myriad floral sources that go into our rich honey. In 2015 we created The Captain's Crackers- oat-based, made with honey, cracked black pepper, sea salt and filled with seeds. They are wheat and dairy free, and the perfect accompaniment to your favourite cheese, chutney or simply on their own. We have since added three varieties to our cracker range- Kentish Ale & Rosemary, Chive & Chia and Warm Chilli. The Captain's Cracked Pepper & Sea Salt cracker won Kent Food Product of the Year in 2016, as well as the bakery and confectionery class at The Taste of Kent Awards. In 2017 and 2018 it was awarded 2 Stars at The Great Taste Awards. At MightyFineThings we are passionate about big flavours. We use fruit and honey from the Garden of England to make Coxy’s Kent Liqueurs and Newton’s of Kent Sauces, Vinegars, Honeys, Mustards and Preserved Fruit. Made in Faversham, Kent we deliver local goodness! Mighty Fine Things started in 2012 on a very small scale, originally selling at markets, events and food festivals and growing to sell our own website and through selected retail partners, bars and restaurants. Both Coxy’s and Newton’s are made using traditional techniques in small batches. Partly because we haven’t got any really big pans or barrels and mainly because that’s what delivers the flavour we’re after. We don’t make or sell anything we don’t love and experience (and a couple of Great Taste Awards!) tells us that a few other people like what we do too. Harrington Foods are a small family run business based in Kent, dedicated to producing two delicious salad dressings. These are made the old fashioned way, without the use of artificial ingredients. 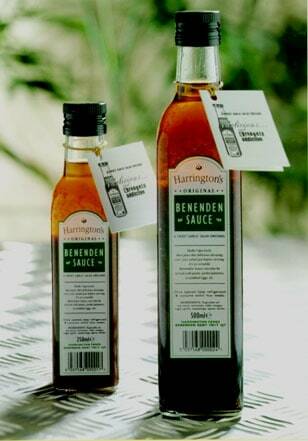 Benenden Sauce is unlike any other salad dressing. It is sweet, tastes of garlic, separates, needs a lot of shaking and is an odd red colour. Unlike most salad dressings it can be used on everything, from pasta, fish, barbecues, savouries, omelettes, to venison and duck as well as salads. Quiddity Dressing is a sweet English Salad Dressing, made with English Mustard and English Malt Vinegar. Again there are no preservatives, additives or stabilisers. It is made using only natural ingredients, just like you would at home.